It's easy to see the shift occurring in North America towards living a healthy lifestyle over a sedentary one. Walk into your local grocery store and you can see how many more options there are compared to a decade ago; organic options, low-fat options, and even keto-friendly options. According to Statistics USA, fitness club memberships have risen from 32.8 million in 2000 to 60.87 million in 2017. While it is encouraging to see the transition, there's a large part of personal health that still needs improvement - workplace health. You've heard before about the importance of ergonomic assessments in the office, but this blog is about the changes an individual can make on their own to better benefit their health and personal goals. No one spends more time at the gym than their workplace, so why shouldn't the workplace be treated with equal importance? Not taking diet into account (that's a whole other conversation), there are very easy changes in habits and positioning that individuals can make at work to improve their health and decrease risk of acquiring certain health problems. One of the most popular ways of altering your positioning while working in the office is with the use of standing desks. 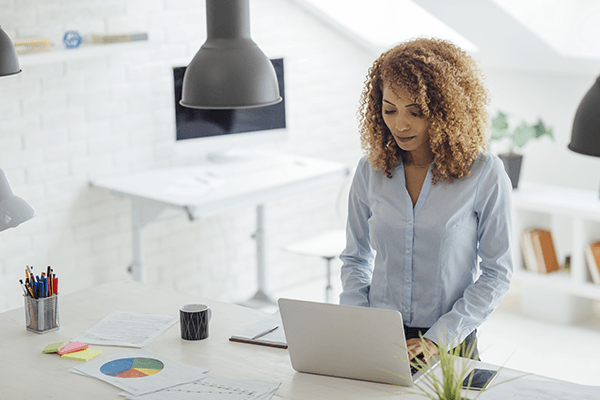 While the research on the benefits of standing desks to alleviate pain symptoms is ongoing and debatable, the conversation is entirely different when it comes to non-pain related health. Standing for 5 minutes every hour has been linked to improving mood, concentration, energy levels, and overall health benefits. Evidence has also shown that 5 minute stand/walk breaks every hour are more beneficial than one longer walk at any time of the day. While sit-stand desks can be costly, some companies opt for a more cost-friendly option: desk converters. These are light, unmounted pieces of equipment that can be propped onto a work station or any table/desk around the office or home, allowing you to work from a standing position. When you're ready to return to sitting, simply move it out of the way. I decided to give desk converters a try and checked out the AnthroDesk: Sliding Standing Desk Converter (Black). It was cost-effective, easy to set up, and able to handle the weight of my laptop, monitor, and keyboard. I leaned pretty heavily onto it with my forearms while typing and no issues were experienced. Both platforms of the converter are easily adjustable to account for different heights of the user, as well as equipment size. There are many different models you can try, do some research before you buy! I really made use of this at home, as it was too easy to prop my laptop on the coffee table and sit down on the couch (anyone who has tried this knows it only lasts a few of minutes before you lean back with the laptop). While the converter wasn't a reason to stand, it was the reason I was able to sustain a standing work posture. I also improved my ability to do work while standing at home; my attempts to work from a standing position were from my kitchen island, but the laptop was too low, causing more discomfort than sitting. The converter allowed me to work at my preferred height. A simple change like a desk converter can not only improve your physical health at work, but also your productivity. There are other easy changes you can implement to improve your health and productivity. Use every chance you have to get up and move, like walking to the printer each time you need it, walking to a colleague's desk instead of e-mailing or instant messaging, or setting a reminder every hour to take a short walk outside or around the office. Set personal goals for yourself to meet every day and you'll start to feel an improvement in no time! You might be stuck at a desk for many hours each day, but as long as you ensure you can stand and walk for a few minutes every hour, you can be confident that you're improving your health. If pain is stopping you from standing or walking around at work, head to your local Lifemark clinic to get yourself checked out.